The Apartment has always been my personal favorite Billy Wilder film, which is cemented with each additional time I re-watch this masterpiece in melancholy. Although the transfer of a classic such as this may not be a notable Blu-ray release, especially with minimal special features bragging about, but I welcome any reason to revisit this poignant and touching dramedy. Billy Wilder was inspired to make The Apartment after seeing the British film Brief Encounter, written by playwright Noel Coward based off of his scene written for the stage. It was directed by David Lean and is about two married people who have a brief affair when they meet at a train station one evening. The couple never sleeps together, but at one point they go to an apartment lent out by a friend, and apparently Billy Wilder saw this as the most fascinating aspect of the film. Years later when censors had calmed significantly Wilder decided to make the film, using his powers at casting to bring a perfect orchestration of talent. The role of CC “Bud” Baxter was written for Jack Lemmon, who had achieved great success in Wilder’s Some Like It Hot, and was now given the chance to bring an enormously touching and humane character to life in The Apartment. Someone like Lemmon was essentially considering the film was about a man who lends out his apartment as a way to advance in his business achievements, and the actor had become well loved by audiences. Other great casting choices include Feed MacMurray as J.D. Sheldrake, Baxter’s boss and the man having an affair with Fran Kubelik (Shirley MacLaine), the elevator woman in the building that Baxter just happens to have a crush on. Without even realizing it he allows her to enter his apartment, and when the affair turns sour it is Baxter who is there is, despite the threats it has to his promotions. With the new release of a Blu-ray there isn’t a great deal of new information that can be found, especially considering so many of the key figures are now dead. The way that the special features attempts to work around this problem is found in having the offspring speak for their parents instead. It works some of the time, although it is a lot of speculation. The “Inside the Apartment” thirty-minute documentary about the film there are a lot of stories given from people who know them more out of being passed along rather than having the information on their own. Therefore there is very little new in the documentary, although it is still mildly interesting and entertaining nonetheless. The other featurette is exclusively about the talented and touching Jack Lemmon, mostly given through interviews by his son about the path to acting that Lemmon took. Perhaps the most insightful of all of the features is a commentary track by film producer and historian Bruce Block. Although the high definition is certainly admirable, however unnecessary it may seem for enjoying the film, the real treat of this film on Blu-ray is simply the reminder. Each time a new edition or version of a film is released it gives us critics a chance to turn more unsuspecting audience members onto an unforgettable classic. If you haven’t yet seen this film, waste no time. 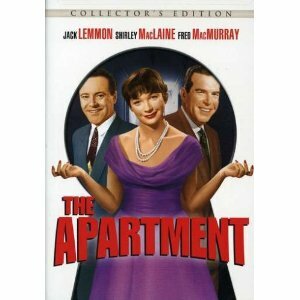 While waiting to see who will win Best Picture at this year’s Academy Award ceremony, watch 1960’s winner; The Apartment. Great review! I just watched this Blu-ray last night. One of my favorite films of all time. Funny, touching, devastating, and bittersweet all at once. Incredibly well-written and beautifully acted. In my opinion, it truly is a timeless masterpiece that still holds up amazingly well today, and like you, I'll take any opportunity to buy a new edition of the film on disc because, well, it's The Apartment.